With the Galaxy Note8, users get a bigger Infinity Display, the S Pen to communicate in more personal ways, and Samsung’s best-ever smartphone camera to capture stunning photos. It’s a device that’s truly designed for the way consumers lead their lives and lean on technology today. But what exactly does it take to plan a product like Samsung’s latest smartphone? 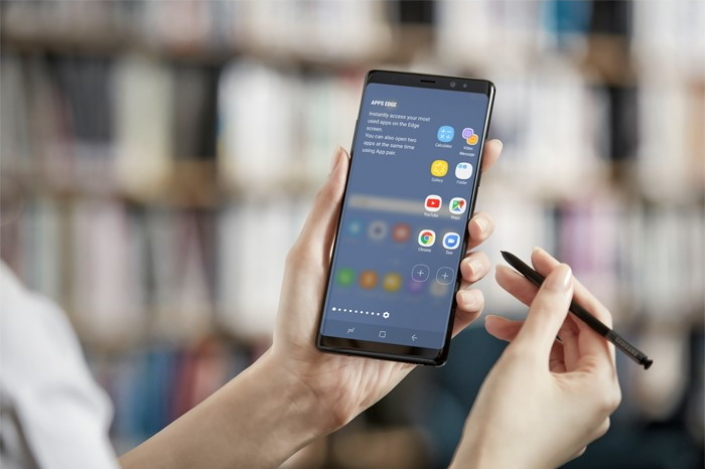 BJ Kang and Cue Kim, of Samsung Electronics’ Global Product Planning Group, Mobile Communications Business, sat down with Samsung Newsroom to explain. 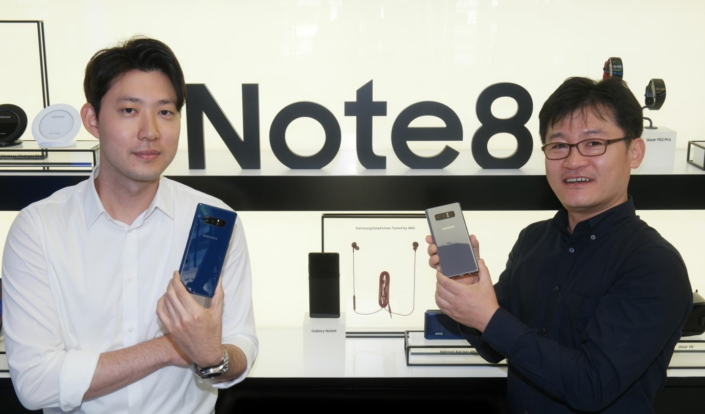 Cue Kim (left) and BJ Kang, of the Galaxy Note8’s planning team. Q. Was the planning process for the Galaxy Note8 different from those of previous products? Kang: Following the Galaxy Note7 incident, Samsung Mobile Communications Business, which had been moving forward so quickly, had the chance to reflect on the core benefits that Note users require of their device. When the time came to design the next model, we made it our priority to reward our loyal users with our most innovative Note yet. Therefore, the product planning process for the Galaxy Note8 was far more intense than ever before. We also extended the assessment period to ensure maximum safety, and our designated task force carefully evaluated the product by means of the 8-Point Battery Safety Check. Q. Did you also prioritize that approach – contemplating core benefits – when determining the Galaxy Note8’s new features? Kim: Absolutely. Whereas before, we took a more ‘big picture’ approach when considering which features to add or innovations to apply, with the Galaxy Note8, we really wanted to hone in on the needs of our users. To help ensure that consumers are getting what they want from their smartphone, Samsung utilizes qualitative and quantitative research methods such as surveys and interviews to better understand how Note users use their device and what they want from it. 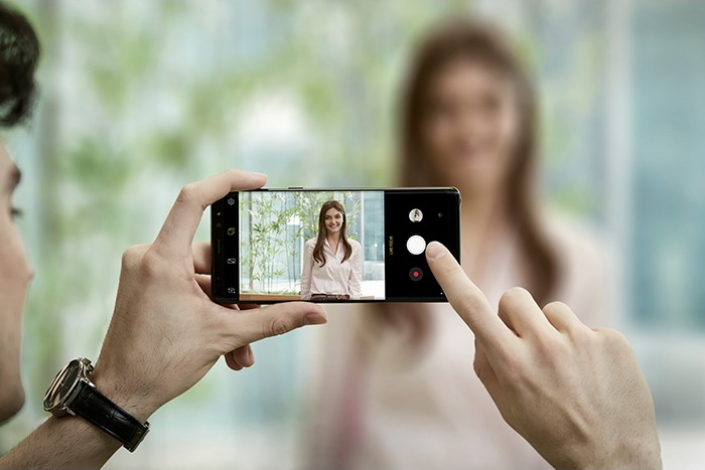 For the Galaxy Note8, we decided to focus on enhancing the camera, the S Pen and the large display because our research, going back to the release of the first Note, in 2011, has consistently indicated that these are the features that users love the most. Q. What is the most important thing to consider when choosing new features to add to a Note device? Kang: Our top priority is the needs of the consumer. We generally develop and refine a new technology over the course of a few years before implementing it into a product. During that time, we closely observe consumer needs and consider whether or not the new technology is capable of meeting them. When the timing is right, we apply the technology. Take the Note8’s dual camera as an example. We’ve been developing this technology for quite some time, refining features like Live focus, which lets you snap beautiful bokeh shots that make your subject stand out, and Dual Capture, which simultaneously captures your subject and its surroundings in a separate image. Of course, fundamentally, a dual camera should not only offer crisp close-up images but steady ones as well, which is why we placed particular emphasis on incorporating seamless optical image stabilization (OIS) technology into both cameras. By the time we’d advanced this technology to a point where it met our stringent standards, the timing was perfect to add it to the Galaxy Note8. Q. Who are your target consumers? Kim: When we originally launched the Galaxy Note series, we had a feeling that business professionals would love it. More recently, the devices’ primary user group has expanded to include just about anyone who values productivity, entertainment and creativity. Millennials in particular are drawn to the Note, as they enjoy its communication customization tools and high-performance camera. Q. In your opinion, which features make the Note popular with business professionals? Kang: Many of the features of the Galaxy Note8 are useful for business professionals! For instance, the Note’s large display enhances productivity and multitasking, while the new App Pair feature lets users launch two designated apps at once from a single icon. We’ve noticed that these users tend to love the Screen off memo feature the most. This allows them to scribble down up to 100 editable pages of meeting minutes or lecture notes right onto the screen, even when it’s off. Q. Samsung Note users are known to be particularly loyal to the brand. How have they responded to the Galaxy Note8? Kim: We already knew that the Note series had a loyal fan base, but the initial reactions to the Galaxy Note8, which were even stronger than those of the Galaxy Note7, made that fact even clearer. Samsung actually invited a number of Note users to the Galaxy Note8 launch event in New York in August, which was essentially dedicated to the loyal fanbase. For me personally, it was extremely touching and motivating to see how passionate Note users are about the product. I was so happy to see that all of the hard work we had put into planning a product that Note users would love had paid off. Q. What’s next for the Note series’ planning team? Kang: Usually, when one project comes to an end, we have a small break before moving on to the next. But this time, we’re not taking any breaks, even though the Galaxy Note8 product planning process was so challenging. We are already considering how to approach the development of the next Note by evaluating the latest model and looking for ways to improve upon signature features like the S Pen. We will continue to keep users’ needs as our number one priority, and will innovate accordingly.